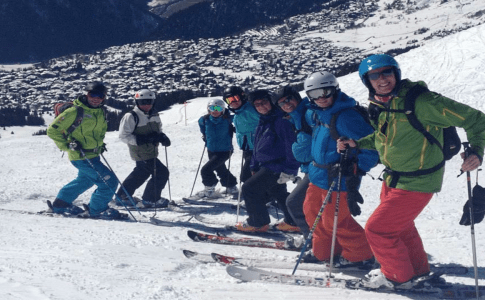 It’s an aim of many people to improve their skiing technique, whether for practical use of being able to ski faster, steeper and for longer or for the feeling of just being a better skier in the crowd you ski with. Either way, people are always striving to develop their ski technique. The main problem people face with this is getting the opportunity to practice technically and physically in an active skiing position. With most skiers getting between one and three weeks skiing time per year it doesn’t offer the same opportunities as say Golf and Tennis to get consistent practice. What a lot of skiers find is that it usually takes one or two days of their first holiday just to find their feet, let alone have time to develop their technique further. Because of this skiers need to find alternative training programs to improve their skiing endurance, strength and technical ability. Dry Land Training for skiing is something that can be used all year round and is not reliant on snow or artificial ski slopes. By using a simple process of jumping from left to right continuously you can simulate an athletic movement that can feel very similar to skiing in short to medium radius turns. When you start to take a look at this it can at first seem almost too simplistic, but when you spend some time trying to jump from left to right and set a series of tasks you very quickly find that it’s not as easy as it looks or sounds. Various aspects can be focused on, including a skier’s symmetry and a-frame issues, skier flex pattern in the legs, middle body and core activation for mogul preparation and short radius turns plus tests to improve balance and dynamics such as jumping without using the arms and striving to jump and launch yourself further with greater dynamics and angulation. 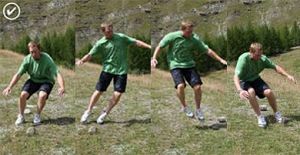 To practice this form of ski specific exercise you can either do it in a gym or better still outside on a terrain with a very small incline. The following tasks will give you plenty of time to develop and improve areas of your skiing technique and prepare for your next winter holiday or ski season. A good test to tune up your lateral control of the legs and keep a good symmetry is a lateral control feet pulling exercise. Use a surface with very little friction, wood floor or bathroom tile surface, and place a towel, t-shirt or tissue on the ground. 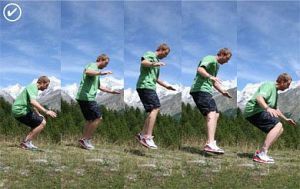 Stand on it with the feet between 60cm’s and 80cm’s apart and see how slow you can pull your feet towards each other. If you can last it out into double figures then you’re doing well. Using the ski simulation exercise, try to feel yourself control the width of your stance at the knees and the feet. It’s not as easy as it sounds and will take 10 or 15 minutes of work to get it right. However, once you get it right to can go ahead and practice with the correct technique using the right muscles to ski symmetrically. Try to get some specific feedback, from a friend, with a stills camera or with video. Once you can see the difference you’ll understand that specific areas of muscle control are needed when turning or jumping from left to right. One of the most common problems in peoples skiing technique is having a flex pattern that encourages your body weight to be back on the skis. This happens with most skiers due to learning to ski in boots usually to stiff and a general instinct when learning that prevents you from flexing comfortably over the balls of your feet. Using the ski turn simulation jumps, try to make about 10 jumps from side to side. With some feedback from a friend, preferably with a stills or video camera, try to see from a sideways angle what is happening with your flex. Look specifically at your ankle flex and knee flex. Start to encourage the ankles to get more pro active in the flex process when you take off and when you land. One way to get feedback of this happening is to try to land your jump without too much noise. Because of the habit of sitting back when skiing, try to reduce the amount of knee flex that typically happens when you land. Instead feel the hips drive down more on top of the balls of your feet with your thighs remaining a little more towards vertical than horizontal, think thigh high! This will also help you avoid overloading the knee joint if you’re often in the back seat position. Once you’ve had a chance to become more aware of the relationship between your ankle flex and your knee flex and when you’ve felt the differences between them and how they affect your balance, try to re test yourself, preferably by videoing. If you can see a more centred posture and less noise from your landing you’ve improved your flex pattern. 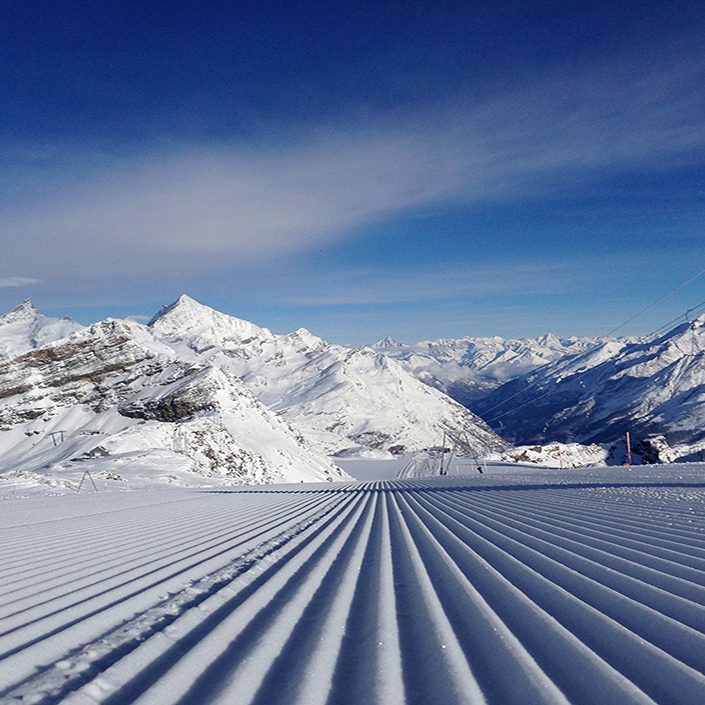 Once you have the muscle memory of this you can easily transfer it to your skiing. A common issue with many skiers when skiing moguls, powder, steeps or general on piste skiing at higher speed, is dealing with the increase pressure compared with skiing easier terrain or at lower speeds. When skiers feel the pressure build up in a turn, whether sudden like with moguls or short radius turns or more progressive with medium and longer radius turns, muscles and joints in the body have to absorb that pressure. A negative outcome that sometimes happens when trying to absorb this is that the middle of the body is too weak and collapses under the pressure. You may have found this happen to yourself when the upper body tips forward suddenly putting you out of balance. People commonly do this in powder and end up going over the front of the skis, also in moguls when hitting the face of a bump. Using the ski turn simulation jumps, try to make about 10 jumps from side to side. With some feedback from a friend, preferably with a stills or video camera, try to see what is happening with your upper body when landing each side. Look specifically to see if you can see the whole of your upper body or whether the upper body is being hidden because of folding. Start to encourage middle of your body and core muscle groups to be more pro active in maintaining a little retained tension so as to avoid the folding when landing. Just by being aware of this you will start to change it. Once you’ve had a chance to become more aware of the core muscles and how you need to keep a little retained tension in them, you’ll soon find that when you’re jumping from left to right you have a much quieter upper body with less forward shoulder movement. You’ll also find that it makes you use the flex in your ankles and knees more effectively as the leg flex no longer has to waste time and precision correcting for the middle body breaking. 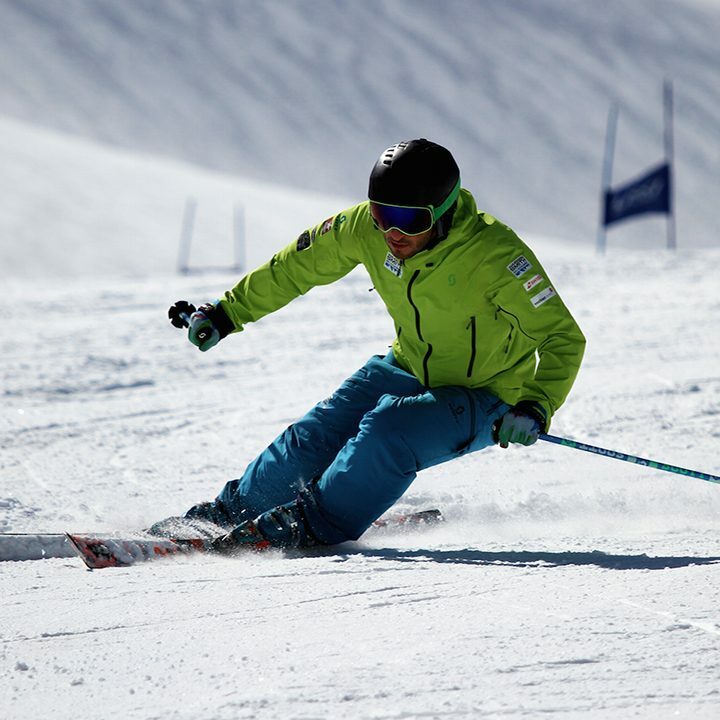 Many skiers switch off a certain amount of the available range of movement in the legs due to a habit of over using the arms to aid the initiation of a turn. When the arms are used to propel the body into the new turn, the legs get away without doing so much hard work. It is technically bad for your skiing to have the arms waving around all over the place. It can cause the weight to go back and also upper body rotation. From a physiological perspective, where you use the arms on initiation, your legs are not getting the training or muscle memory to help them develop as the arms are doing most of the work for them. 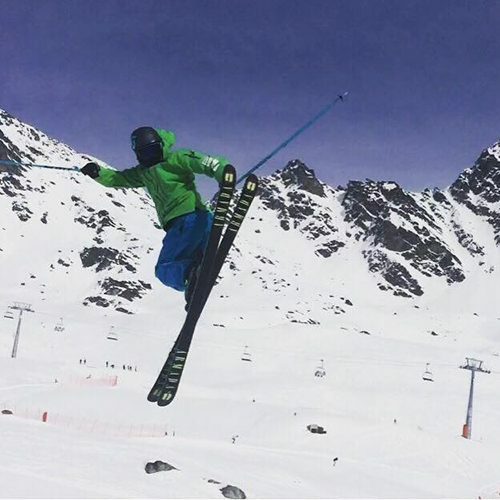 To become a better technical skier and to train the legs to have more power on the initiation of the turn, try to think about your arms and how much you use them. To train the legs to do more of the work when your skiing you can sometime try skiing with your arms folded to completely take them out of the equation. 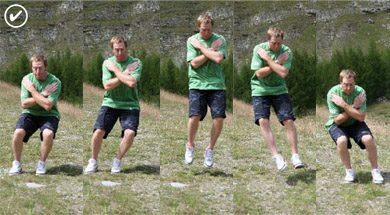 This can be done on snow and also on the Dry Land Training exercise of jumping from side to side. Using the ski turn simulation jumps, try to make about 10 jumps from side to side. With some feedback from a friend, preferably with a stills or video camera, try to see what is happening with your arm movement when you’re about to launch to jump each side. Repeat the ski turn simulation jumps this time with your arms folded. This will feel more difficult but will encourage the legs to do more of the work and increase your balance skills. Once you’ve had a chance to become more aware of your arms and how much you over use them you’ll soon see just how much more you use and train your legs. By using the legs more specifically in this way they will get exercised more and become a strong power mechanism for you in your every day skiing. It’s a common wish for many recreational skiers to improve and increase the dynamics of their skiing. Many skiers would like to have more leg lean when carving and more of a dynamic, confident launch into a new turn direction. Normally the only place to practice this is actually during your ski turns. This sometimes isn’t enough to get big changes and developments in your skiing, especially when you only get one to three weeks a year. A great way of improving your odds at getting more dynamics out of your ski turns is to simulate and practice some of the athlete movements needed to make those types of turns off of snow. Sometimes on snow you can be restricted by the surface you are trying to achieve on (icy or bumpy) blocking your movements and confidence. Dry land training exercises can build confidence and fitness in the ski specific movements with turning left and right on skis. By jumping from side to side you can simulate the explosive launch into a new turn and also the angulation needed to stay in balance and keep a strong edge grip whilst carving around turns. By setting parameters on a patch of land, you can test the distances that you can jump from side to side. By using markers on the ground, you can first of all get an understanding of what your initial limit of performance is. After understanding your limit you can adjust markers and set out a program to develop your range of jumping side to side and ultimately raise your performance level. Taking into account the four previous dry land training exercises, you should be able to work over all the points on a course you set out for yourself. Each of the points will add performance and increase your ability to gain extra power with launching off the spot into the direction of the next marker. Once you’ve worked out how to optimise your launch and gain good airtime, try to allow the legs to swing underneath your hips into a well angulated position with the upper body. This angle that you create will be similar to the position that you need to adopt on the mountain to carve through your ski turns. It’s also very similar to how you would set your body in a tug-a-war competition. Keep trying to develop your dynamics with good angles in the body and over time you’ll have a better understanding of how to react in a ski turn at higher speeds and also how to project your body to initiate dynamic turns.